We are pleased to introduce Deborah Peeples as JSSA’s new chief development and external affairs officer. “Deborah is an experienced, top-notch development professional. I’m thrilled that JSSA was able to add someone of Deborah’s caliber to head our fundraising efforts and help us communicate our value to the community,” said JSSA CEO Todd Schenk. A Certified Fund Raising Executive (CFRE), Deborah has established herself as a leader within the social services nonprofit community through her work at Capital Hospice (now Capital Caring), Iona Senior Services, and Food & Friends. At the Humane Society of the United States, Deborah led the philanthropy department to triple annual major gift income in less than three years. Most recently, she has been consulting for nonprofits in the Washington metropolitan area. “Like many people in our community, I’ve had many personal connections with JSSA over the years. Their scope of helping services are unmatched by any other single organization, and I’ve looked to them as an essential resource for my friends and family who need counseling, hospice, home care, or other help,” said Deborah. “I’m very excited at this opportunity to be working alongside an incredible team of professionals and volunteer leaders to ensure that JSSA has the capability to serve everyone who needs and desires support,” she added. 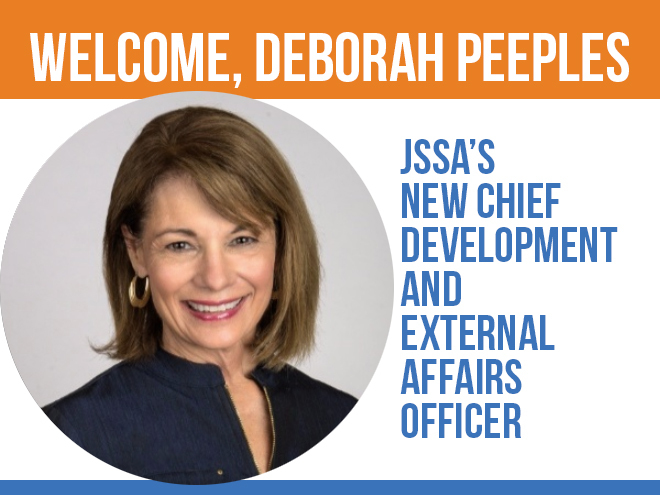 Deborah looks forward to connecting with members of the community in the coming months and invites supporters and partners to share their JSSA stories with her at dpeeples@jssa.org.